Solar simulators are used in test and quality control for modules and panels to measure their conversion of light to electric current. There are two types of solar simulator: continuous and pulsed. Continuous simulators provide a steady illumination for a longer period of time; pulsed apply a flash type illumination of shorter duration. Both types of simulators are classified as A, B, or C simulators according to IEC and ASTM uniformity, and temporal stability. It is important to ensure that your solar simulator is meeting the requirments for its class as cells, modules, and panels are typically categorized and priced according to simulator data. Measuring the uniformity, or more accurately non-uniformity of a solar simulator ensures that the defined area covered by the simulator is accurately and consistently illuminated. While solar radiation is remarkably uniform, a simulator is hard pressed to meet this consistency. ASTM standards provide the allowed non-uniformity for each class of simulator as well as the procedure for measuring non-uniformity. 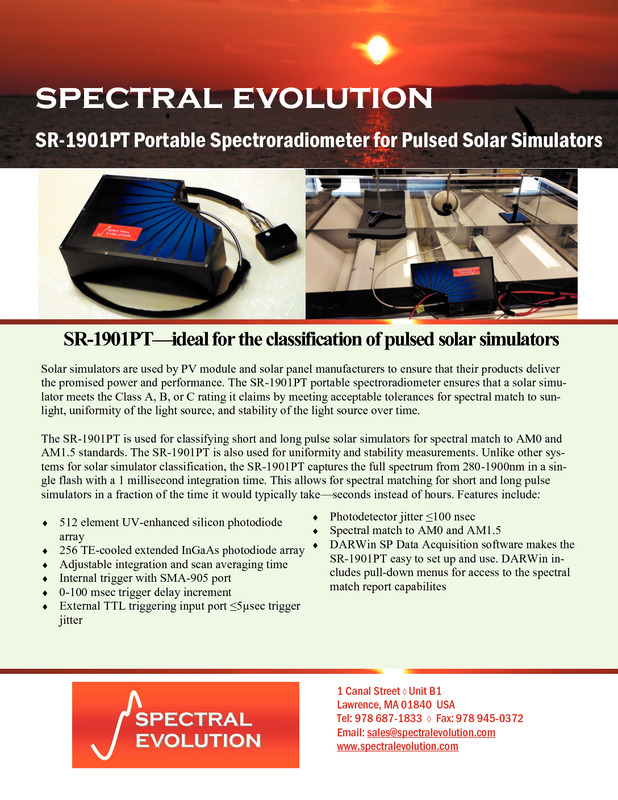 Spectral Evolution provides spectroradiometers to measure uniformity for both continuous and pulsed solar simulators. The SR-3501 and SR-1901 can be equipped with a right angle diffuser for uniformity measurements of continuous simulators, The SR-1901PT and SR-2501PT are specifically designed to measure pulsed simulators. Uniformity testing can be done with one of these spectroradiometers and a right angle diffuser. The area covered by the simulator should be divided into at least 36 equally sized test positions. The right angle diffuser should be positioned at the outer perimeter of test areas along each edge. Non-uniformity of irradiance for Class A is 2%, Class B 5%, and Class C 10%. 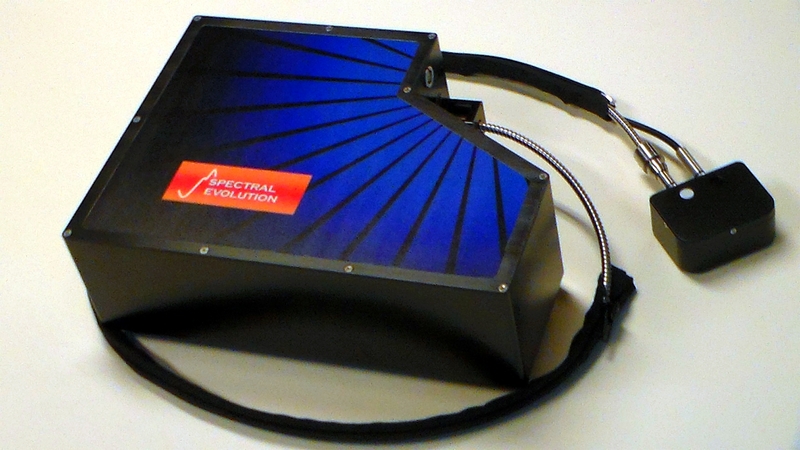 A Spectral Evolution spectroradiometer fitted with a right angle diffuser calibrated for irradiance was used to measure uniformity of a commercial solar simulator. Measurements were taken by moving the right angle diffuser to different parts of the output light. 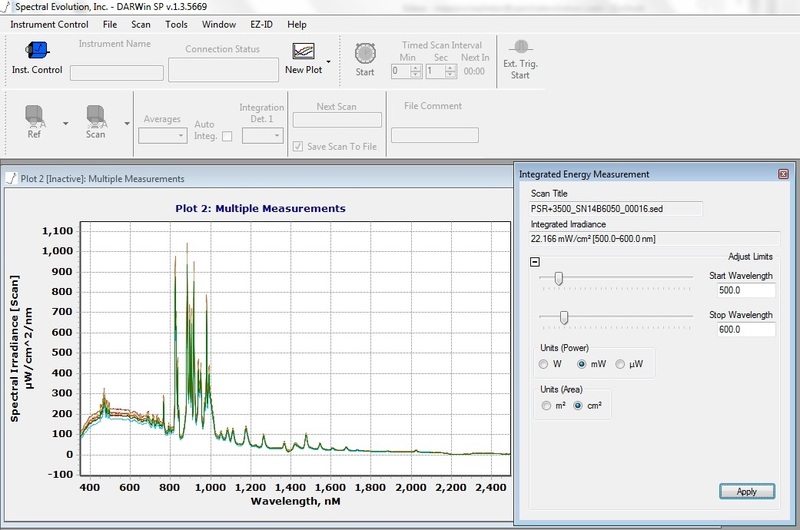 The DARWin software includes an energy integration utility (as seen above) that allows the user to integrate total energy detected over a user-defined wavelength range. 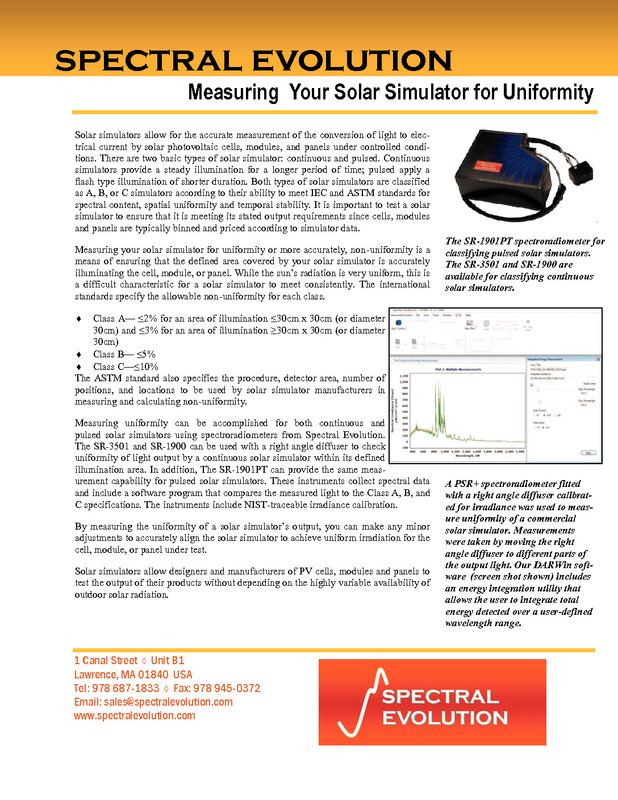 Download our Application Note on measuring solar simulator uniformity for more information.